Rinse quinoa in fine mesh strainer. Bring water to a boil and then add rinsed quinoa. Reduce heat, cover and simmer for 20 minutes or until all the water is absorbed. Let the quinoa cool for about 15 minutes. In a large bowl, add quinoa. Fluff up with a fork. 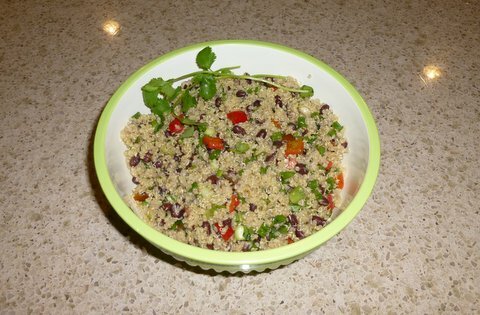 Add all of the ingredients listed through the cilantro to the cooked quinoa. Mix thoroughly and toss with EVOO and vinegar or citrus juice. Add diced avocado when ready to serve. You may need to adjust the seasoning at this time.